Before e readers and tablets came around, blind and visually impaired readers had to rely on braille, large-print, or audiobooks. Now, the visually impaired can use a Kindle or other e-reader or tablet to enlarge the font right in the screen. I can attest first-hand that reading a Kindle is much less tiresome on the eyes than reading print books. That is definitely a huge step up from lugging large books around. No more bulky travel bags. The font adjustments in the Kindle are very helpful for creating a less tiresome reading experience, not only for the visually impaired, but for people who don’t have any vision loss. That in turn enables us to read for as long as we want to. As long as time permits, of course. The latest studies show that people who have central vision loss can benefit from reading on a tablet such as the iPad or Kindle Fire. The level of contrast between the text and background helps speed up the reader’s reading levels. The sharpness and clarity of the text on the background is important. On tablets, you can use either black on white, or white on black. There is also a more neutral setting that doesn’t create such sharp contrast. So, the added customization can fit the needs of more readers. Overall, e readers have a lot of potential for opening up a world of reading and literacy for people who otherwise wouldn’t have that opportunity. With that said, the technology still has a ways to go to meet the needs of all readers. Text-to-speech is currently a controversial service, and isn’t offered on some Kindles. Including audio menu navigation and the ability to read books via audio on the Kindle go a long way for those who can’t read print at all. Out of this year’s Kindle lineup, I am the most excited about the Kindle Paperwhite. Other than the light, it looks just like the traditional e-ink Kindle that is compact and easy to carry around in your purse or bag. The front-lit screen is the major draw for me. I am a voracious reader, and often wish I could read my Kindle in situations where it is dark, like night time car rides, etc. It will be interesting to see how this new lighted Kindle will impact the book lights that are currently out on the market. My best guess is that they’ll hold their own for awhile since so many people still own the older models or the basic Kindle. The other major reason is a much needed upgrade for the touchscreen technology. The Kindle Touch had issues with trails from previous pages. The text is crisp, but it could use a tune up. The complete list of features can be found on Amazon. The Kindle Paperwhite comes with or without Special Offers. It also comes in a 3G or Wi-Fi only model. After light, there is only one major upgrade: color. At least, that we can think of. Technology changes almost daily. Next year perhaps? I would like to see a tablet that can use both LCD and e-ink, or something that fulfills the purposes of each. That way, I wouldn’t have to tote a bunch of difference devices around. The Kindle Paperwhite ships October 22nd just in time for the holiday shopping season and should give the Nook Glowlight a run for its money. Amazon has launched a new service for Kindle Fire and Fire HD owners called Kindle FreeTime Unlimited. This is an extension of the Kindle Fire feature, Kindle FreeTime, which allows parents to activate parental controls and set time limits on their child’s screen activity. This service, designed for ages 3-8, provides a pre-sorted selection of TV shows and games from big names such as Disney, Nickelodeon, Marvel, Sesame Street, and more. Amazon has built up a robust collection of apps and TV shows in their appstore and video library. Kindle FreeTime Unlimited is a monthly service. For Prime members it is $2.99 a month for one child, or $6.99 a month for the whole family. For non Prime members it is just a few dollars more a month. New Kindle Fire owners get one month for free. Since the internet is so easily available these days, it is tough to monitor what kids watch or do online. Kindle FreeTime Unlimited is age-appropriate from the get-go, so there’s no need to worry about your child coming across something they aren’t supposed to be watching. Individual profiles can also be set up so that every member of the family can have their own content on the same device. Kindle FreeTime Unlimited will download as part of an upcoming over-the-air Kindle Fire software update. The best part about the unlimited service is that there’s no need to worry about accidental in-app downloads to run up the monthly bill. But at the same time, the parents still have the ability to set time limits using the original Kindle FreeTime features. So, if you have the new Kindle Fire or Fire HD, keep an eye out for this new feature coming out soon. This is something that can be both fun and educational for the whole family to enjoy. Can the iPad Mini Give the Kindle Fire a Run for its Money? In Steve Jobs’ biography, he repeatedly stressed the importance of creating fewer, top of the line products, rather than a slew of mediocre ones. Apple has always thrived on branding and staying ahead of the game. It surprised me that the iPad Mini is not only real, but it is named exactly what rumors called it. Is Apple getting too predictable? Now we have a big variety of sizes for tablets and smartphones in the Apple lineup. Most people can reconcile having both an iPad and an iPhone, but can you do that for the iPad Mini and the iPhone? I don’t see it taking the hold of the 7″ tablet market like the original 10″ iPad currently has on the larger tablet market. Obviously, price is one factor. The iPad mini is $329, whereas the Kindle Fire HD, Nook Tablet, and Nexus 7 are all $199. So, they will attract different types of consumers. For thee moment, I don’t think the Kindle Fire HD has too much to worry about from that end. The Nexus 7 is proving to be a solid competitor, but competition is good because it make the devices strive to get better and better with each generation. It used to be that the major tech giants excelled in different areas. Google held the monopoly on search engines, Amazon was the pioneer for ebooks, Microsoft reigned over the PC market, and Apple took control over computers, and later music. Now, they’re all trying to one up each other by creating competing products. This can be quite overwhelming for the consumer! Maybe it is best to just let them duul it out, and see what the winners are. As far as choices go, longevity is a good thing to consider. 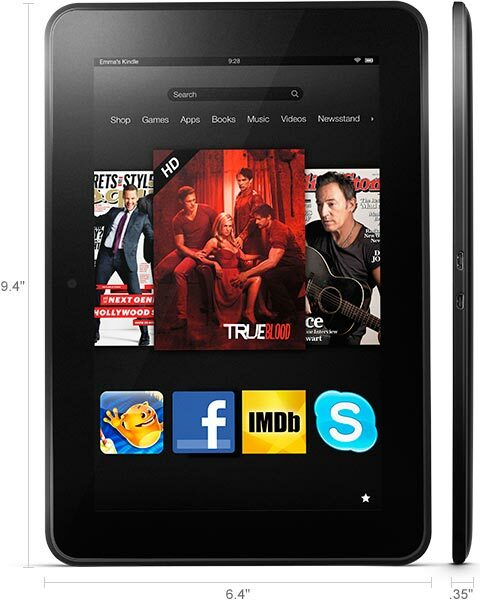 The Kindle Fire is in its second generation, and has ironed out some issues that the first generation had. The new Kindle Fire family includes better display, better designed hardware, and a camera. Amazon also has a good sized marketplace with a free app every day. For the 10″ inch tablets, the iPad still dominates that market, and has had a couple of years to improve. Apple of course has a huge appstore, and includes a number of business apps. Only time will tell what the winners will be in the tablet market. It is sure to be a wild ride. The Kindle Paperwhite is reclaiming the top of the e-ink reader market with positive early reviews. The Kindle Paperwhite is Amazon’s newest generation Kindle that includes front-lit lighting designed to enable readers to read at night, or in darker settings without eyestrain. The e-ink quality is better, leading to sharper text and images. The screen is designed to create a reading experience closer to that of reading print books. This was the original goal when Amazon first developed the Kindle. The touch screen isn’t as sensitive. The Kindle Touch would skip chapters or pages sometimes if I so much as breathed on it. The device itself is smaller, more streamlined, and includes a grip back cover similar to the Kindle Fire. Then, last but not least, there is the built in light, designed to spread evenly across the screen and give off a cool ambiance that does not hurt the eyes. Not including audio is mostly an author or publisher issue. It knocks out consumers who rely on audio to read. For example, readers who are blind, or others who just prefer audiobooks over text-based books. While it isn’t an issue with the majority of readers, including audio is a good feature to work on for future software updates or Kindle generations if Amazon really wants to reach out to the broadest audience possible. There is a cool new accessory for the Kindle Fire and other tablets called SlideFrame. SlideFrame is handcrafted by the founders of SlideWare studios, which is based in California. The company was founded in January 2012 by two Stanford students who are veterans in the tech industry. It looks a lot like those digital frames you slide your digital camera card into that creates a slideshow of pictures. Those frames don’t have much variety as far as frame style goes, however. The tablet uses its own memory while in the SlideFrame, so you aren’t limited to 2GB of memory that comes with many of the digital frames. Tablets sales are catching up quickly with PC sales, but they have a few limitations still. Since tablets don’t include a slot to upload pictures, there’s not really a good way to showcase the pictures in a way that others can see them without actually emailing or sharing them via the internet. The frames come in bamboo and wood, giving them a more homey feel than the aluminum or plastic that surrounds electronics. Just be careful about the battery life! The additional styles give the SlideFrame a leg up over the traditional digital frames. SlideFrame comes in sizes that fit both 7″ and 10″ tablets, as well as other sizes, so it should still work with the new Kindle Fire regardless of the size . So, overall, SlideFrame is a neat idea, and I hope more effort will be made to provide accessories that serve both aesthetic and functional purposes. 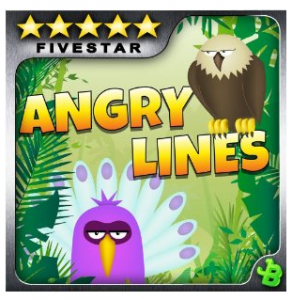 Angry Lines is a bird-matching game for the e-ink Kindles. Once upon a time, there were flocks of happy birds living together on a tropical island. A storm came and scattered them all. After being separated, the birds got angry, hence the name Angry Lines. All the player has to do is match up two identical birds: eagles, owls, parrots, and more, in order to advance to the next level. That sounds simple, until you actually sit down and play the game. Angry Lines gets challenging pretty quickly. Not only do you have to match the birds, you have to find a way around the other birds to get to the correct match. The game is set up like a grid. As long as there aren’t any birds blocking your path, you can move your bird towards its match both vertically and horizontally. The graphics are crisp and easy to see. The birds definitely look angry! The different kinds of birds are easy to distinguish, but finding matches that are not already paired up adds a new twist. On the Kindle Touch, you select the bird you want to move, then tap the spot that you want to move it to, then tap that spot again. It is a bit tedious, but I think it is more straightforward than trying to drag the birds around in one swoop. The Kindle Touch doesn’t always handle swiping very well. On the other e-ink Kindles, you can use your toggle button to move the bird to the intended spot. It is a good fit for the simplistic e-ink Kindle platform because it doesn’t require too much action other than maneuvering around. If you are looking for an inexpensive strategic thinking game that is fun for all ages, Angry Lines is a great one to try. New Kindle Lineup to Debut September 6? Amazon has a big media even scheduled for September 6th. Speculation points to the debut of this year’s Kindle refresh. 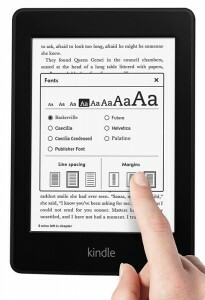 The new lineup could include a larger Kindle Fire, and updated version of the current model, and backlit e-ink Kindles. The Kindle Fire has some serious competition now from Google’s Nexus 7, the rumored iPad Mini, and the Nook Color and Nook Tablet. 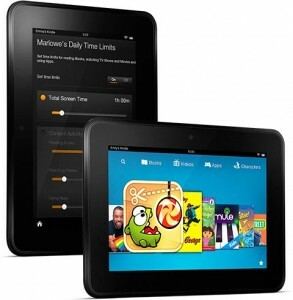 One of the keys to the Kindle Fire’s success last year was price, and the competitors have recognized that. So, what will be this year’s big idea that will cause the Fire to leapfrog over its competitors? 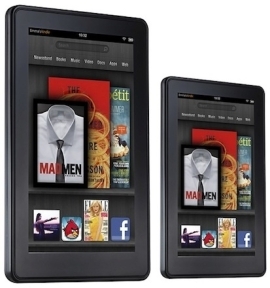 A larger Kindle Fire can undercut the iPad in price, and Amazon has the means to make a good quality tablet. We’ve seen a lot of attempts to dethrone the iPad, but no one has really come close, yet. 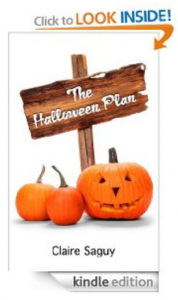 Amazon has a robust collection of books, apps and videos, plus the Prime perks, Kindle Owner’s Lending Library, Prime Instant Video, and a free app a day from the appstore. Good covers could be key: one with a keyboard built in, or one that can help boost battery life. Moving on to the e-ink Kindles. The biggest upgrade this year will be the backlight. This is pretty much a given because of the release of the backlit Nook earlier this year. I am really excited about this development because I will be able to read comfortably in all lighting conditions. No need to worry about carrying around external light attachments. Preserving the long lasting battery life will pose a challenge, however. The Kindle Touch is currently available to purchase from Amazon directly. So, that is a clue that something new is coming. The Kindle Touch should see an update in touch interface quality. By that I mean smoother navigation and page turns without previous page remnants. 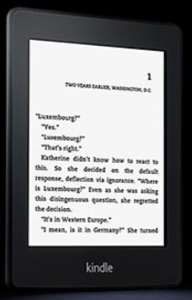 E-ink Kindles: Lighted version of the Kindle Touch and basic model. Older models: Selling at a reduced price until inventory runs out. There will most likely be 3G and wi-fi only options, as well as models with or without special offers. This lineup should appeal to the broadest audience possible, remain competitive across the board price wise, and stay on top of the competition in terms of features and accessories. Stay tuned. It will be a wild couple of weeks.